Why ASP.Net Web API and Not WCF? Even with WCF REST starter kit (or new features in WCF 4), we didn’t get any of the client-side libraries. Although we did get most of the service-side features, the new inspectors feature is not included. Although some of the service-side features were well-integrated into WCF, others required the use of ASP.NET by turning on the ASP.NET compatibility mode. To get some of the new features in WCF 4, you needed IIS hosting and ASP.NET. 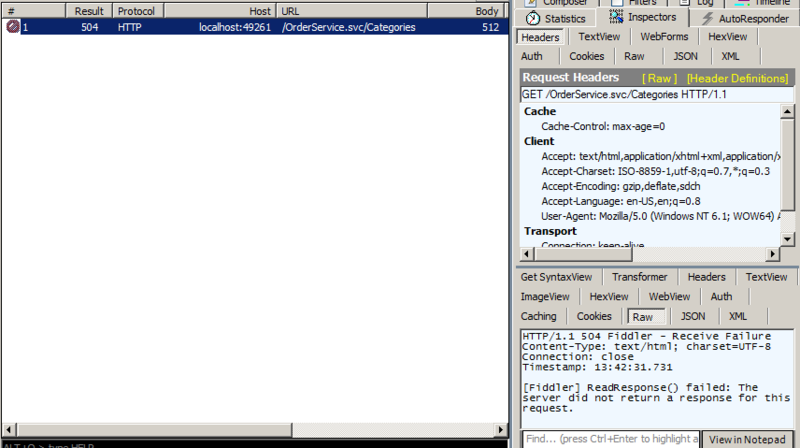 Not all types of requests were supported easily (ever tried posting HTML form data to a WCF HTTP service?). Overuse of CLR attributes to define the POST/GET/PUT/DELETE was tedious. 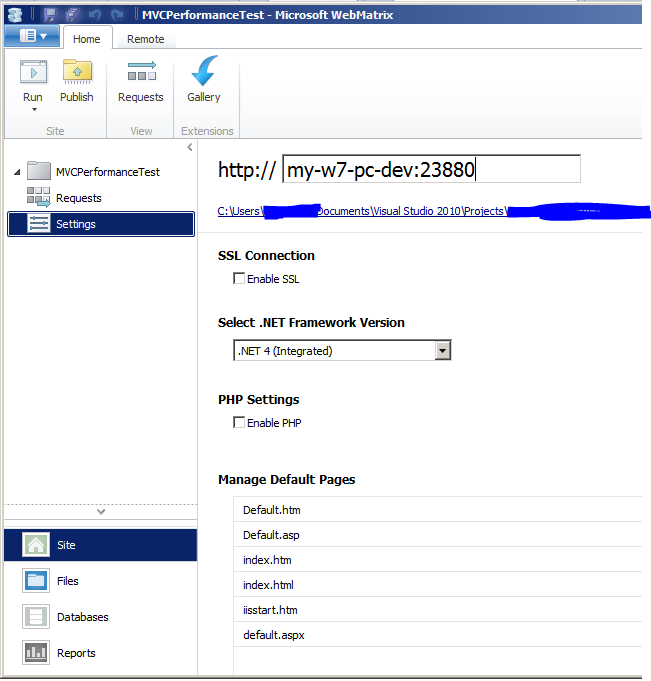 Configuration required to create “Web” HTTP (RESTful) type of services with all of the endpoint behavior. WCF is heavy in configurations. WCF infrastructure did not support testing well. 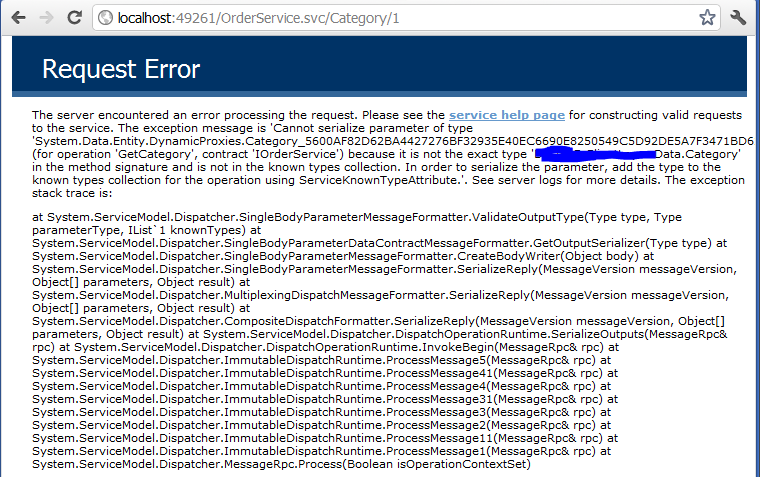 This annoying error keep popping up when my WCF method return a POCO object generated by DbContext generator. This problem is caused by serializing problem when WCF method try to serialize DbSet<T> (or ObjectSet<T> in case of using ObjectContext generator) into POCO objects. Add KnownTypeAttribute to POCO object. In POCO class, add KnownType attribute. Also, add DataContract and DataMember attribute if not present. Object type to be passed to KnownType attribute should be all collection objects that are member of the POCO class. In this case, Product. If the POCO class is generated with T4 template, you might want to modify the template to include these attributes. Disable ProxyCreationEnabled in Context configuration. Why we need to disable POCO proxies? By default, web application hosted in IIS express can only be accessed locally (localhost) and it will block all external traffic. Run the following command in Command Prompt with Administrator privilege. Where my-w7-pc-dev is name of the machine. You can’t customize this, it must be name of the machine. This will basically add the mentioned URL to HTTP.SYS, a handler for HTTP requests. Using Microsoft WebMatrix, edit Settings of the site to use the same URL you register to HTTP.SYS. More about Configuring HTTP and HTTPS. When saving changes (ObjectContext.SaveChanges())in Entity Framework, we have access to original and current values. These values can be used for audit trailing / change tracker. 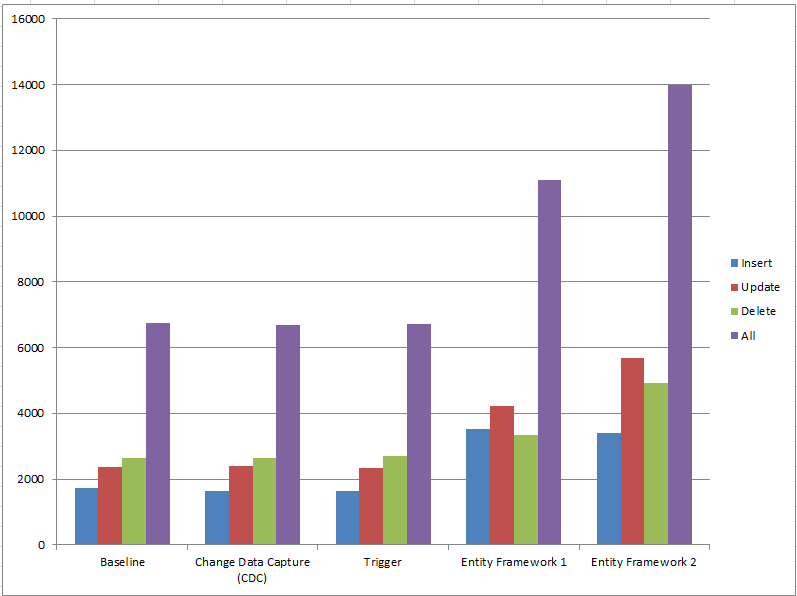 The class DbContext.ChangeTracker provides access to these values. As one might have suspected, the entity context must derived from DbContext. To access these values, we can loop through ChangeTracker.Entries<T>() or ChangeTracker.Entries(), which is a collection of DbEntityEntry<T>. Then, to access original or current values, we dive into DbEntityEntry<T>.OriginalValues or DbEntityEntry<T>.CurrentValues, both of which are type of DbPropertyValues. Below are audit trail performance testing in different technologies / approaches. Baseline: Standard DML operations with no audit trail. Change Data Capture (CDC): DML operations with CDC to capture audit trail in system tables. Trigger: DML operations with trigger to record audit trail in different table. Entity Framework 1: DML operations with audit trail recording in Entity Framework’s SaveChanges() method by accessing EF’s OriginalValues object for tracking data changes. Entity Framework 2: DML operations with audit trail recording in Entity Framework’s SaveChanges() method by accessing EF’s DbSet object for tracking data changes. Test results are in millisecond. Operations are performed with 500 records. Contains all HTML elements and attributes. No deprecated tags are supported. Framesets are not allowed. Code must be written correctly. If XHTML, the markup must also be written as well-formed XML. Contains all HTML elements and attributes. Deprecated tags are allowed. Framesets are not allowed. If XHTML, the markup must also be written as well-formed XML. Contains all HTML elements and attributes. Deprecated tags are allowed. Framesets are allowed. If XHTML, the markup must also be written as well-formed XML.